Let The Great Alien V Speculation Thread Begin! The general consensus among fans — hell, most moviegoers in general — is that the first two movies in the Alien franchise are great, and the rest, not so much. I think Alien is one of the best movies ever made, period, and that Aliens is one of the three or four best "real" SF movies ever made. Alien 3 has some incredible art direction, but it's kind of a downer, to say the least. Alien Resurrection is the Batman & Robin of the series, an attempt to restart the franchise as a goofy '90s-style action vehicle in the vein of Speed, but even then it's got some interesting feminist subtexts from screenwriter Joss Whedon (it's just too bad they're tied in to such a crappy movie). Prometheus — well, we've established that it's a thing that exists. It's really pretty, at least, which is more than you can say about the AvP debacles. So if Ripley and Hicks are still alive, as the production art suggests (albeit now viable for Space AARP coverage), it's pretty likely that Alien 3 and Resurrection are no longer canon, as Ridley Scott and Damon Lindelof were saying three years ago when they were doing advance publicity for Prometheus. This has been a fan theory for some time — that the easiest way to write off the last two Ripley-centric films in the franchise is to simply retcon the third and fourth movies in the series as weird dreams Ripley had while in hyper-transit back to Earth from the LV-426 system. Although an even tidier solution would be just to ignore them altogether. So I'm going to guess that unless the plot is a lot more complex than it seems, that's really Ripley from Alien and Aliens, not a clone, not an android, not some crazy simulacra created by ancient xenotechnology a la Grace Augustine in the Avatar sequels. And if Hicks is still around, then Newt/Rebecca probably is, too, and hell, maybe they even patched poor Bishop back together. 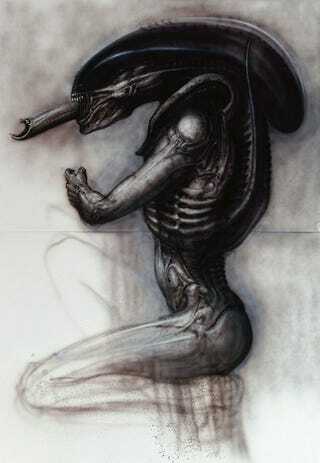 So what would Alien V (or is it "III"?) be about? My guess, based on the bits of artwork we've seen, is that it would parallel aspects of the plots of Alien and Aliens, with Newt transitioning into the Ripley role. Like Ripley in Aliens, she would be haunted by the tragedy and horror of the Alien infestation, and filled with thoughts of revenge for both the Alien species and the soulless company that sought to exploit them. My theory, possibly based on some old garbage I scrawled in a geometry textbook around 1986 or so, is that after the events of Aliens, Weyland-Yutani was brought down by lawsuits from the relatives of the LV-426 colonists and broken up by the government, with its various corporate divisions shut down or spun off. But a rogue operation continues at a secret location, another Space Jockey crash site or maybe some Mountains of Madness-type colony established millennia ago. (If you really wanted to fold Prometheus into the storyline, it could be the Engineer outpost on LV-223.) Through some external source — possibly Hicks, now high up in military intelligence — Newt discovers this hidden facility. Seeking justice and revenge, she sets out, possibly with a ship and crew of her own, to destroy it, with Ripley and Hicks in rapid pursuit. Needless to say, once there, our heroes discover a new and unspeakable Lovecraftian horror with nightmarish implications for the future of humankind, probably involving the xeno-based bio-armor/power suits that we saw Ripley wearing in Blomkamp's paintings (which also recalls elements of District 9). Which Science Fiction Movie Gives The Best Corridor? Speaking of video games, keep in mind also that Blomkamp's first movie for a long time was going to be a Peter Jackson-produced adaptation of Halo for Universal. Halo is absolutely saturated in Alien and Aliens-style aesthetics — the designers cite Cobb as a major influence on the look of the game — and Blomkamp's pitch reel from nearly a decade ago looks an awful lot like Aliens (with maybe even a little bit of Alien 3 mixed in). My guess is that his movie would have a very Halo/Aliens-like look to it, possibly mixed with the gothic, biomechanical stylings of Giger's creatures. Everybody's about the shared universes these days — and Fox has two, with the X-Men/FF/Mutantverse and the Alien-Predator-Prometheus axis. Would Alien V be an attempt to set up a new iteration of that universe, with Newt as the Tony Stark/Wolverine/Skywalker figure? Alien V could dovetail eventually with the Prometheus trilogy, and Newt and her crew (think a more action-oriented variation of the Nostromo bunch) could run across the Predators in the course of their wacky adventures. The current trend is to build a universe around a central character, played by a big star, and then gradually nurture other satellite movies in the same universe, with some of the same cast, to create synergy and mythology. If Fox and Blomkamp got a major action-oriented young actress to play adult Newt — say Jennifer Lawrence or Shailene Woodley — they might be set for a very long time. Or it could all devolve into Alien Vs. Predator Vs. That Squid Impregnator Thing very rapidly. Anything's possible — and there's no guarantee any of this could be any good.